Comic Con came to Vermont last month and The Escapist was there to see the sight and take pictures of the Green Mountain State's cosplayer in action. Last month the state of Vermont got to add another notch to its geek belt thanks to the success of its very first Comic Con. While a family trip sadly kept me away from the convention's Saturday debut (stupid family that loves and wants to spend time with me), I had the pleasure of dropping in the day to peruse the sights and sounds of the Green Mountain state's gathered geekdom. While it obviously wasn't the largest cons (there's only 625,000 people in the entire state), it showcased local artists, talents and vendors that I had previously had no idea about. As with any good convention, of course, it also had its fair share of cosplayers. There weren't the heaping oodles that I've seen at some larger events, but Vermont's costume community still did a fine job of filling the floor with fictional characters brought to life. 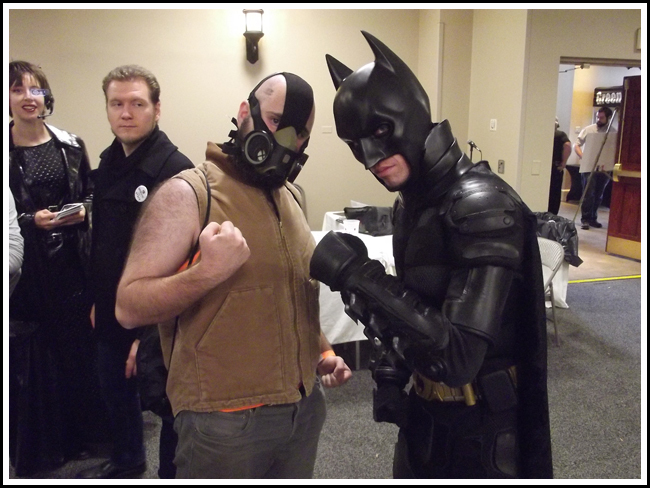 First up is a nicely done duo recreating The Dark Knight Rises' Batman and Bane.